The false spring was there to make fools of us, just as I predicted. Since my last post we’ve had two big windy storms, big enough to take down branches, plus yesterday brought the heaviest hail shower that I’ve experienced for several years. But the lighter evenings do bring a sense of relief and the spring equinox is shortly upon us, time for a resurgence of energy and resolution. Speaking of energy, Harry and I both succumbed to chest infections, which are now on the way out, but point to the importance of nutrition and rest. 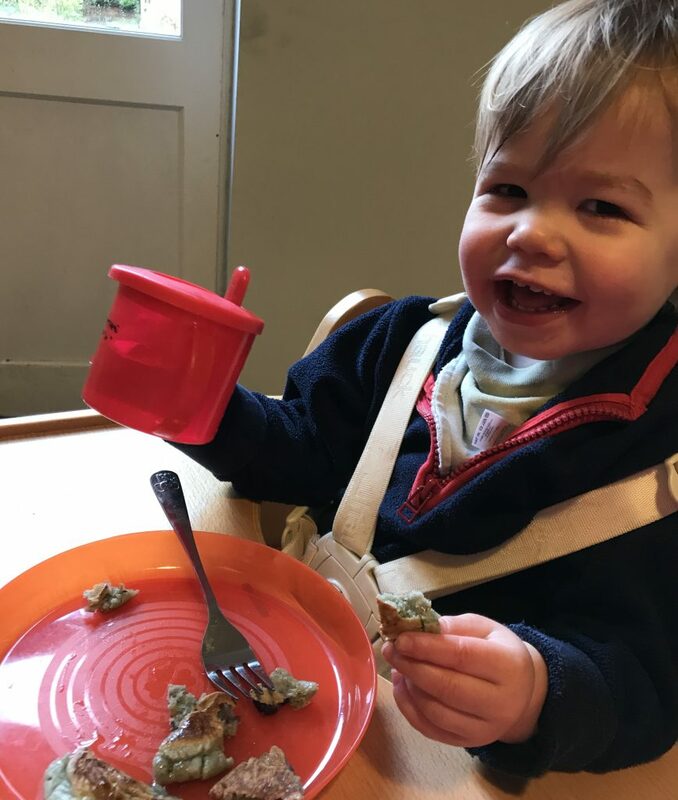 Last week I experimented with purple pancakes – these are American-style pancakes with blueberry compote stirred into the batter before cooking – which gave us a good dose of protein, calcium, carbs and (most importantly) fun. Harry loves purple pancakes. Make a regular pancake batter and swirl into a few tablespoons of blueberry compote, then cook as normal. 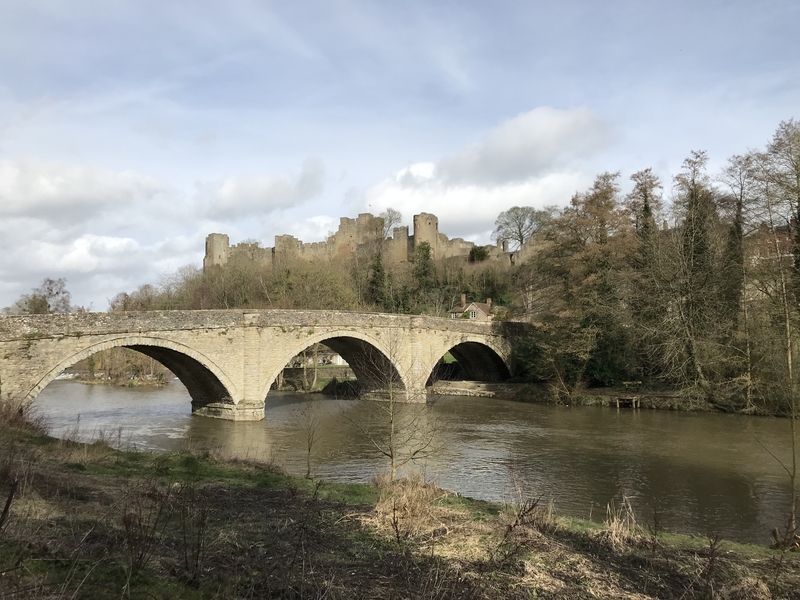 There was also a trip to Ludlow, home of the world’s greatest butchers and greengrocer, to restock the freezer with proper sausages, bacon, a bunny or two plus a sensational leg of pork. Back home, the garden is changing from brown to yellow. 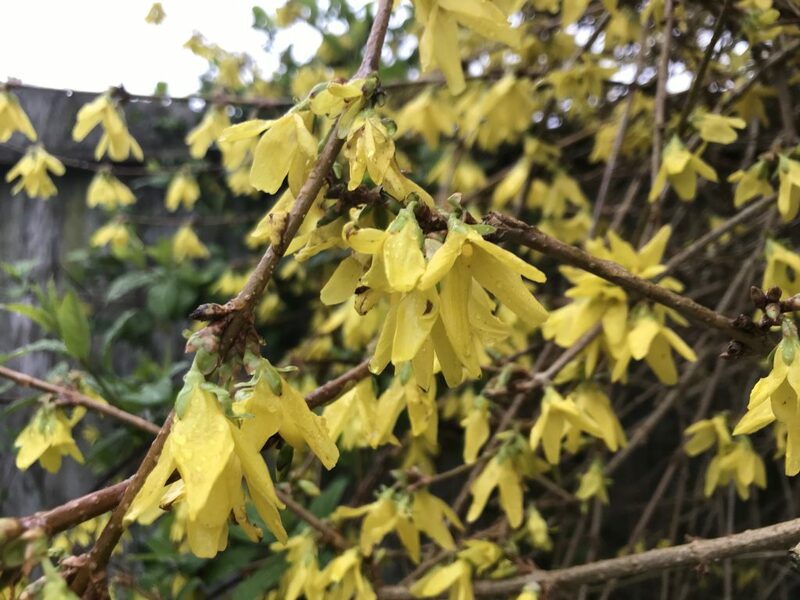 The forsythia came into bloom last week, with its optimistic bright yellow flowers hanging from branches like fairy skirts. 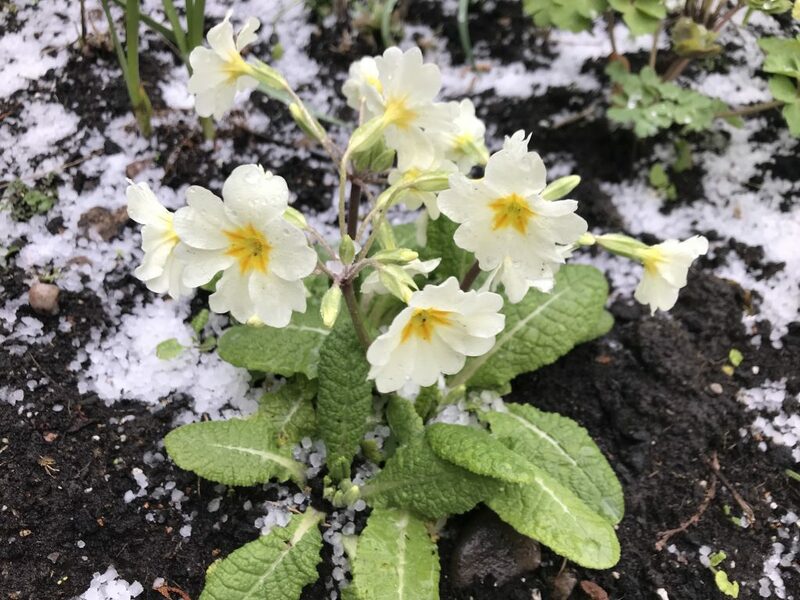 The primulas that we lifted from Granny’s garden before she passed are thriving – a softer yellow than the forsythia, they provide pleasing pops of colour that can be seen from the sun room. Meanwhile I have a space issue. 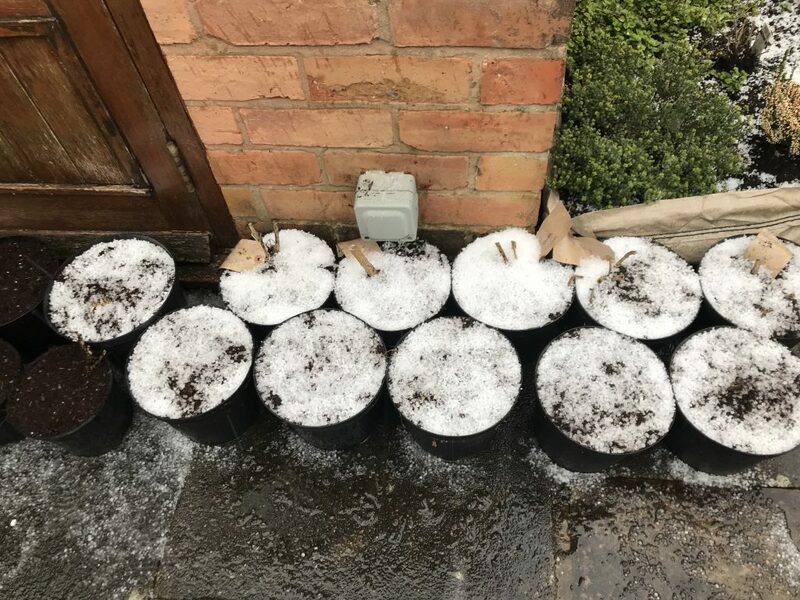 Our Victorian house contains only 1 windowsill and 1 smallish cold-frame, meaning that spring-time seed sowing is an exercise in logistics. It’s a constant juggle of succession sowing and tray-turning to get things started. 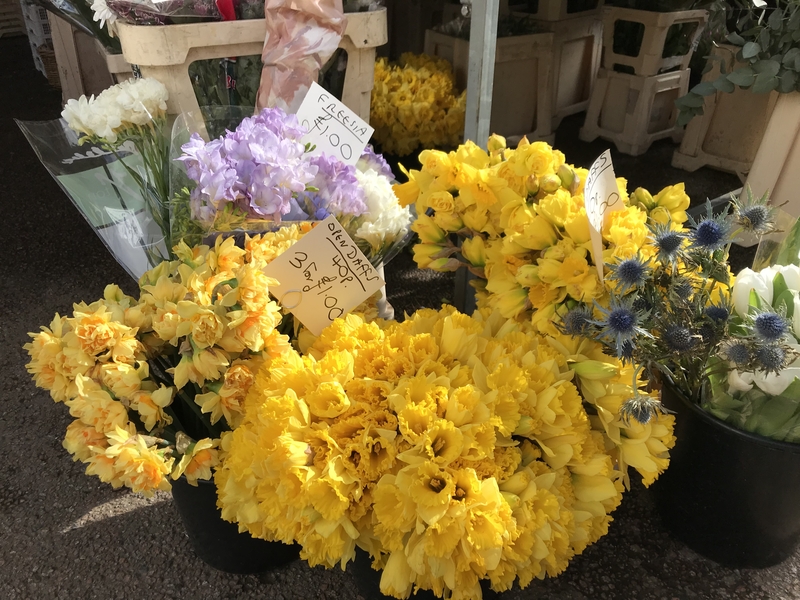 This year I have unfathomably got about 40 different varieties of flowers, herbs and veg that need sowing over the next month or two, and only a postage-stamp amount of room to keep them in (Matt promises that he will apply his hive-mind to this issue). 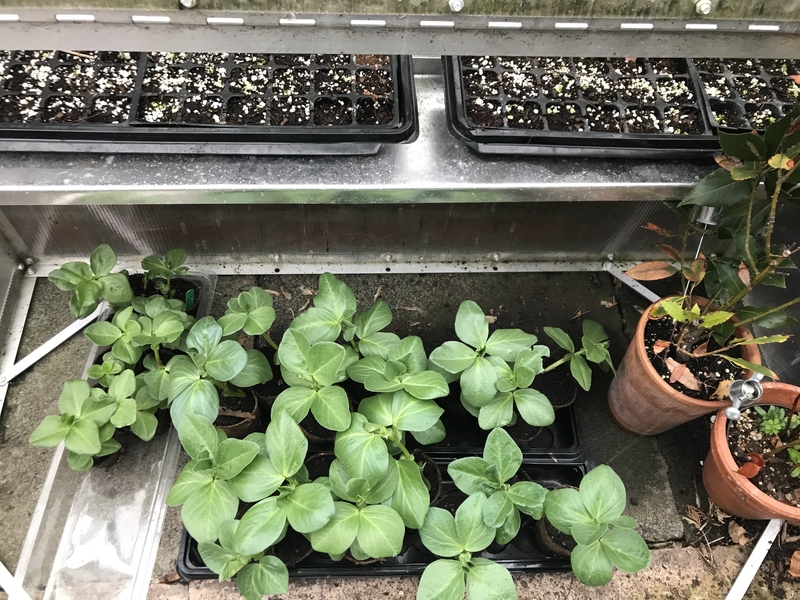 Meanwhile I have also (equally unfathomably) amassed a collection of nearly 20 dahlias, all of which I potted up yesterday in the hail, and which are now snuggly resting in big trays in the sun room to begin their ascent to full-flowering August glory. My labelling is dubious at the best of times but I particularly enjoyed unwrapping the bag-for-life full of shrivelled tubers and a single pink Post-it noting “jewel colours for garden or allotment”. I have absolutely zero idea where these came from but I look forward to seeing how they progress. Somehow I have amassed a collection of dahlias, all of which are dubiously labelled, now potted up after their winter snooze. On to today’s recipe. Since the Frugality Challenge I have become very aware of using meat to its best potential, so that it lasts for loads of meals. The other week I bought a large whole chicken, took it down to its essential parts (2 breasts, 2 drumsticks, 2 wings, 2 thighs, carcuss) and froze each piece individually. This is far more economical way of shopping than buying lots of individual packs of thighs or breasts, plus the portions tend to be larger – and thus better value – when taken off a whole bird. The legs were marinated with yoghurt, garlic and spices brought by my friend Claire from her recent trip to Morocco (thanks Claire), before being baked and served with flatbreads and salads. The breasts were turned into this wonderful jalfrezi, from Jamie Oliver’s Super Food Family Classics book. I love that it’s very simple, very healthy and genuinely delicious, plus there’s no special ingredients needed, as it’s made with store-cupboard and fridge staples. This does involve whizzing up a curry paste but even that isn’t too much bother, and the chicken can be marinated in advance if that makes life easier. We ate it up with rice, home-made tarka dal, a chopped salad of cucumber, tomato, onion, mint and coriander, plus Matt’s vegetable pakora. Highly recommended. from Jamie Oliver’s Super Food Family Classics. Serves 3-4 with side dishes. For the paste: Toast 2 teaspoons of cumin seeds with 1 teaspoon each of coriander seeds, fenugreek seeds and black mustard seeds in a dry frying pan until toasted. Tip into the food processor with 2 cloves of garlic, a big knob of ginger, 1 teaspoon turmeric, a pinch of salt, 2 tablespoons vegetable oil, 2 tablespoons tomato puree, 1 fresh red chili and a handful of fresh coriander. Whizz the lot to a puree, adding a splash of water if needed. Slice 1 large or 2 small chicken breasts into large chunks, then place in a bowl with 2 tablespoons plain yoghurt, the curry paste and a pinch of salt. Massage the paste into the chicken then set aside to marinate. Dice one red onion and two peppers (red, yellow, green, or a mixture) into large chunks. In a dry frying pan or casserole, stir-fry the vegetables until they start to char – this gives good flavour to the curry. Tip in the chicken and any excess marinade, then cook for 3-4 minutes until the chicken begins to turn opaque. Tip half a tin of chopped tomatoes into the pan with a good splash of water, stir to combine, then leave to cook on a low heat for 10 minutes until the chicken is cooked through, the veg is softened and the sauce is thickened to your liking. Check the seasoning – add a squeeze of lemon if you like. Serve with rice, daal, salad and raita. Cooking & eating: Ludlow pie and chips; chocolate muffins; blue pancakes; cherry flapjacks; Moroccan-baked chicken; apple & blackberry galette; hot cross buns; roast pork shoulder with crispy crackling; phenomenal amounts of tea. Outside: The conifers at the end of the garden were removed this morning, opening up massive amounts of light into the wilderness. Reading: Mildly obsessed with Up: My lifetime’s journey up Everest, Ben Fogle’s account of climbing Mount Everest. Make mental note that life has become dull and so, whilst I have no desire to climb any mountain whatsoever, we should plan some adventures for 2019. This entry was posted in Recipes, Savoury and tagged chicken, curry, easy, healthy, jalfrezi, jamie oliver, super food family classics. Bookmark the permalink.